I haven't been posting/reading much on the fresh loaf lately and I haven't been super pleased about it, but due to lots of work around the holiday season and general lazyness my TFL activity has decreased but my bread baking is still at a fever pitch. Last month or maybe early this month, after a bunch of saving and waffling I finally joined the I have a mill club and I'm super excited about it. After my initial first few attempts and semi passable failuers I'm getting the hang of the fresh flour deal and with the new sifters my lady friend got me for christmas and the Bob's Red Mill factory outlet store a really hard stones throw away I expect I will only delve deeper. This rascal pictured above was my first real success with fresh flour and it tasted tops. 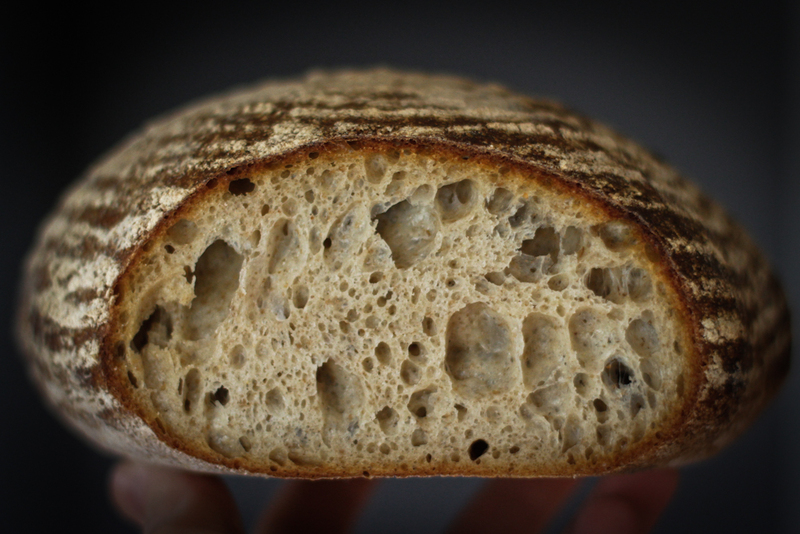 I used an all fresh ground rye levain and an additional 13% fresh ground hard red wheat that I sifted with cheese cloth to 82% extraction (thats what cheese cloth leaves you with) to bring the fresh ground total to 20%. Right now I'v got some hard red tempering (a first for me) and I'm building my levain up with plans to bake on monday. This time around I will up the fresh ground percentage to maybe 30% and with my glorious new sifter I will sift the red to 70%. A new toy - uh, I mean tool! Opens the doors to new explorations. Your 'first' looks terrific, and we'll look forward to seeing many more. Nice loaf. There is no going back once you've done it. 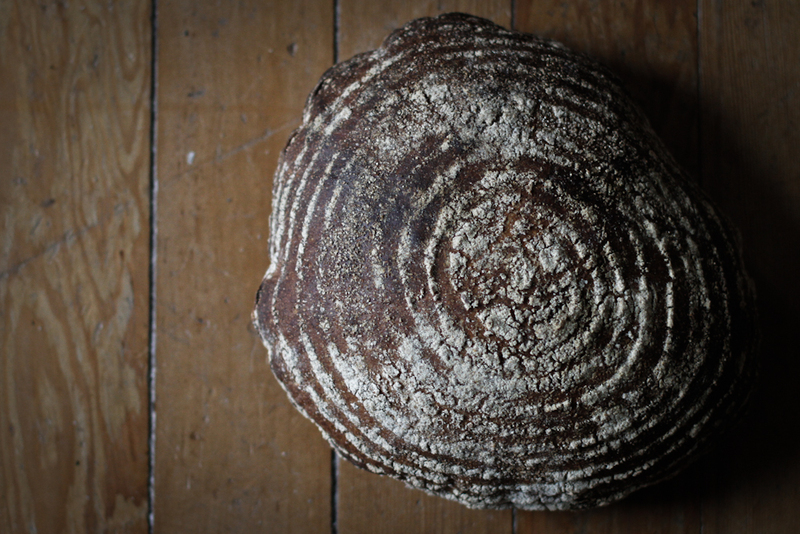 It takes some tinkering to get used to but the flavor is unmatched by commercial flour. In a sense it's what I think my "tasters" are hooked too. The taste of fresh flour in their bread. What kind of mill did you end up with? I'v had some from other millers before but never until now had the chance to mill my own, I got the country living mill. The main appeal was that big ole fly wheel, Soon to be pedal powered. Can you do "high milling"? My terminology is probably from the 1800s. I mean multiple-pass milling where the bran and germ is flaked off separately, leaving the endosperm as a grain, so you can have a final pass and mill endosperm only? the phrase is new to me but it sounds like a cool concept. I'v probably do some reading and if plausible give it a whirl. to get to a 5 day bake (like 3 isn't enough) is to sprout some whole grains, dry them and then mill them for some sprouted whole grain bread. The step up in flavor from commercial flour to home milled is substantial and going to home sprouted and milled flour will be another leap toward bread Nirvana:-) Love this bread WS - a real beauty! Well done and happy milling and home baking WS. I will be stepping up to sprouted flours on my next weekend! a dehydrator! Got one from Santa this year. a big part of what has kept be from sprouting so far. mainly not knowing how dry is too dry. One of my housemates has a big one so i'm in luck on that front. Me too! Right now my cat is sleeping on top of it :) Will have to wait until the New Year before giving it a whirl. Nice to see you are enjoying your new toy. 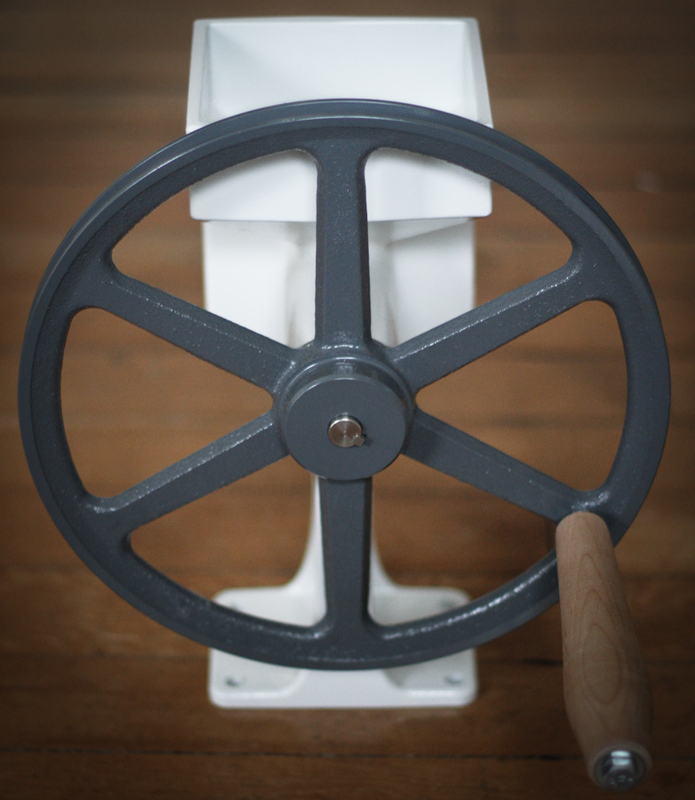 It's hard to replace the taste of freshly milled grains. I agree that now that I'v started to go fresh I will be hard pressed to go back. Come on dude...share the details on the new toy - what mill did you get and why? How is it working out? I got a Country Living mill and its working great. I got it for a number of reasons mainly the big fly wheel that just so happens to be grooved for a v-belt practically makes this mill beg to be pedal powered, Also I am big into heavy cast iron, life time warranties also don't bother me in the least. The fact that I can take it apart and mildly understand what I see is also of great appeal. My only gripe thus so far (and its minor for sure) is that this rascal is heavy and really needs to be bolted to a table that is attached to the ground or wall for proper security, as it is now I bolted it to a little bench I made but its still almost a two person job to mill, one to stand on the bench and one to grind. that will all be sorted out once its mounted to a jig with an exercise bike and my weight holding it in place. What mill did you get? I'm currently having my diamant restored, considering having it mechanized, and also considering a Komo mill. I got a country living mill. It was the highest quality within my price range and the flywheel grooved for a V-belt appeals to my pedal power aspirations.